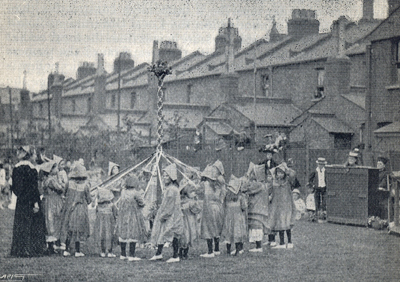 Children dancing the maypole dance in the garden of Mansfield House in the 1890s - what Maud later described as being a 'made up dance'. 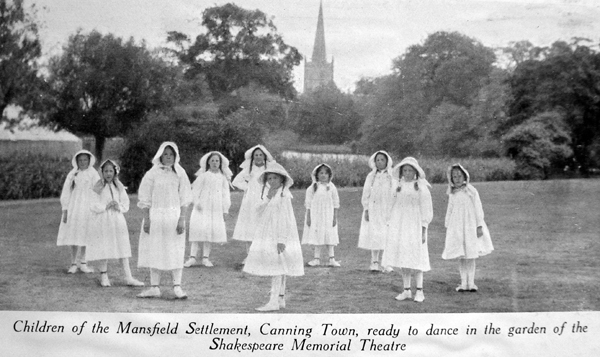 Sharp therefore became increasingly concerned about the freer interpretation of Morris dances by the Esperance girls, and the loss of ‘authenticity’ this adaptation created, and welcomed the rigorous way in which Maud was teaching the Canning Town children. 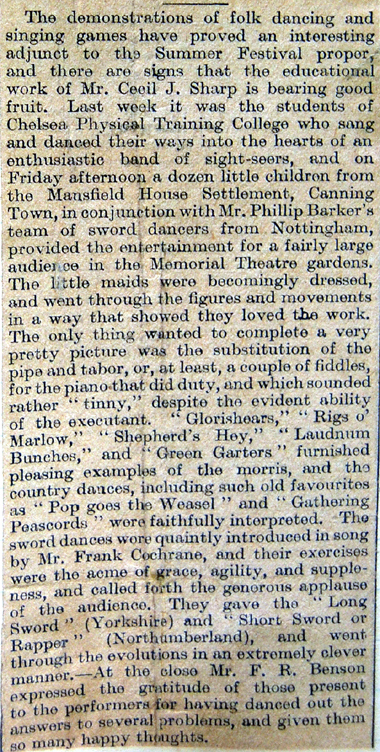 After Neal challenged Sharp’s claim that the choreography he had ‘collected’ was in any case ‘pure’, the Governors of the Shakespeare Memorial Theatre were forced to take sides. They eventually came down in support of Sharp, and so his teachers and dancers replaced the Esperance girls at the summer school. This, of course, included the Karpeles sisters. 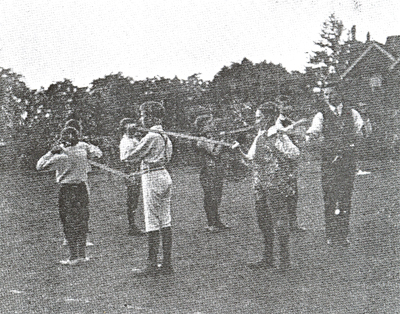 Cecil Sharp’s 1911 summer school at Stratford Upon Avon ran for several weeks, with some people attending for the whole period and others for just a week. Many of the students were teachers, who wished to learn the dances in order to teach their pupils when term started again. 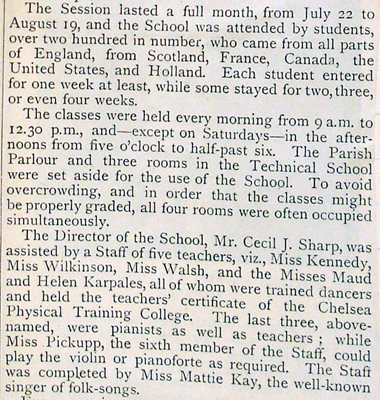 Sharp had succeeded in making folk dancing part of the state school curriculum, and teachers could often earn higher salaries if they had the certificates to prove that they had trained to the required standard. Each week of dancing finished with a party and demonstration by invited dancers. 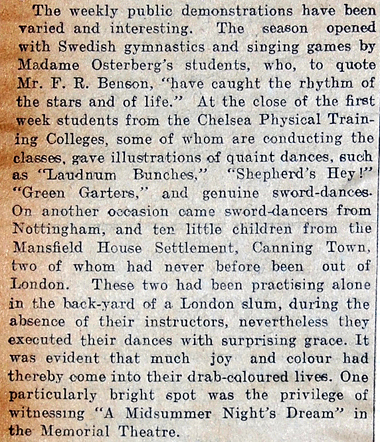 In August 1911, Maud’s Canning Town children went to Stratford to demonstrate their skills and were an instant success. 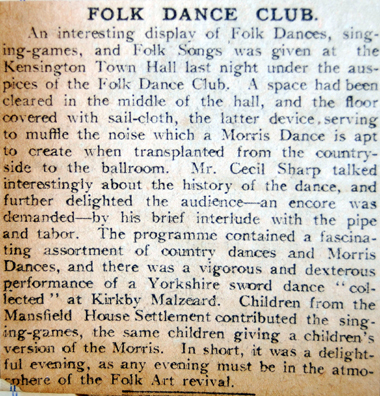 Later that year they demonstrated dances and action-songs at Kensington Town Hall — previously a showcase for the Esperance girls — where they also received national press coverage. 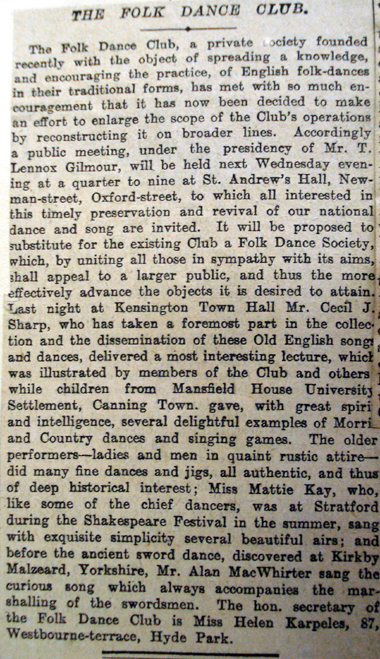 As was mentioned in last month’s Magazine, the Mansfield House Children’s Folk Song and Dance Club had been asked to be responsible for one of the weekly demonstrations of folk dances which were held at Stratford-on-Avon throughout the Summer Festival. At the conclusion of the lecture the children had tea, and were then taken to the theatre to see a performance of “A Midsummer Night’s Dream”. For many of the children it was their first visit to the theatre, and the performance proved quite a revelation to them. The fairy scenes attracted them most, Puck receiving the greatest share of admiration. After the performance the children returned to the inn to bed, and thus ended one happy day. The next morning they were up betimes, and the hours between breakfast and lunch were busily spent in sight-seeing, and in a steamer trip up the river. 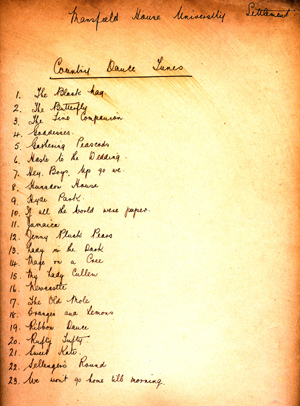 Handwritten list of country dance tunes from the Mansfield House archives. In the afternoon the great event, for which the children had come to Stratford-on-Avon, took place in the Theatre Garden. The groups of children dancing on the lawn, with the river and the old Church in the background, formed a very charming picture. The performance passed off most successfully. The children’s dancing was at its best, and their efforts were greatly appreciated and warmly applauded by the audience. 16, Country Dance, “Gathering Peascods” (Playford’s English Dancing Master, 1650); 17, Morris Dance, “Laudnum Bunches” (Oxon. ); 18, Green Garters (Oxon.). 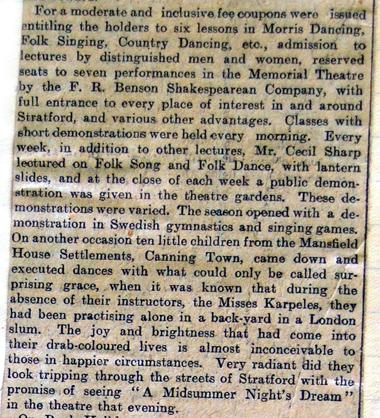 In spite of this exacting programme the children still had sufficient energy to dance the Processional Morris, headed by a fiddler, through the streets of Stratford until they reached the Shakespeare Hotel, where they had been invited out to tea. After tea the children wound up with a chorus of folk songs, and then, alas, it was time to hurry off to the station. 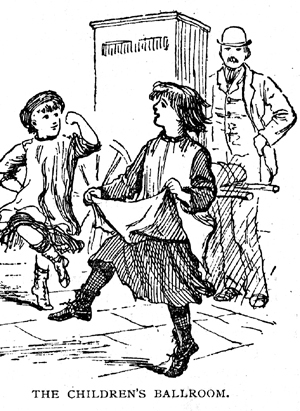 Great was the children’s regret at having to leave Stratford-on-Avon, but they were cheered by the thought of being able to relate their happy experiences to their families and friends in Canning Town. 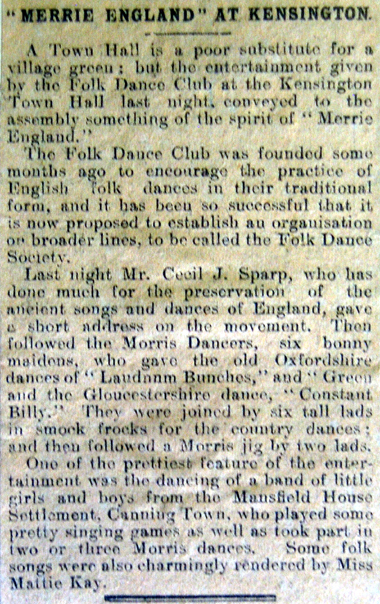 The above images come from the English Folk Dance Society/Aston Mansfield archives in Newham Archives at Stratford Library, and should not be reproduced without permission.